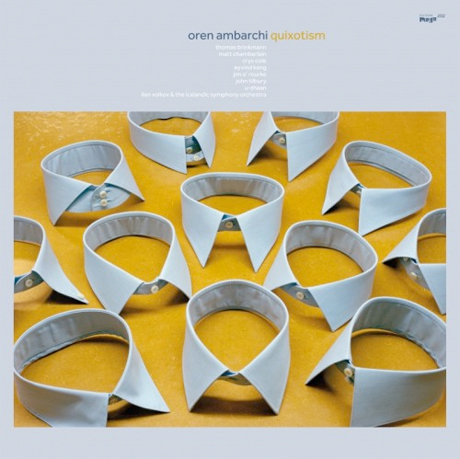 Editions Mego is preparing to release a new album from Oren Ambarchi, and it looks to be another ambitiously adventurous work from the experimental Australian guitarist. Quixotism is due out on September 29. Rather than being your average collection of tracks, this consists of one continuous 47-minute piece. It's divvied up into five sections, with various parts recorded in Cologne, Reykjavik, Melbourne, Seattle, London, Los Angeles and Tokyo. Based on a listing on Kudos Records, it appears that the tracks are simply titled "Quixotism Part 1" and so forth. Among the contributors on the album are Matt Chamberlain, Jim O' Rourke, Thomas Brinkmann, Crys Cole, Eyvind Kang, John Tilbury, U-zhaan, and Ilan Volkov & the Icelandic Symphony Orchestra. That's the album cover up above. This isn't the only lengthy piece that Ambarchi has released through Editions Mego. Below, stream 2012's Sagittarian Domain, which clocks in a over 33 minutes. Thanks to The Wire/FACT for the tip.